We just don’t want to agree, that the roti maker doesn’t have anything to do with how delicious the roti will turn out. As we believe, that the best roti maker will lead to the best roti ever. 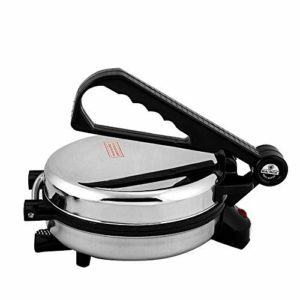 With this being said, it is really a hard task for you to find and get just the best roti maker that you and your family will love. And because we hear your adversity, we are here to help you out! 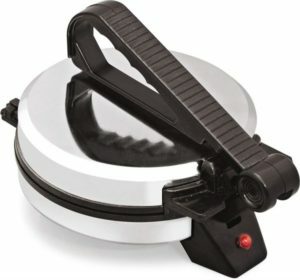 We have squeezed in all the user reviews and data online about roti makers in the market to bring you the best pieces of advice you need before buying one. 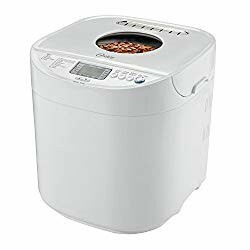 There might be 100s of roti maker models out there but no need to check each one of them as we have listed only the best amongst those. These are the only ones you need to put your focus on. These 6 models got your budget, style, and features need all covered. We know you are already excited to know, read on below to find out. Enjoy! 1. Do I need to put oil first on the plate before using? 2. What is the watts difference of the upper and lower lids when heating? 3. Can I clean this? 4. Can I use this to make khakra and other dishes? How to Make Soft Rotis with Roti Maker? 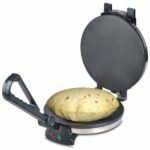 Figure out first which type you want to go for and then you can decide the best roti maker for you based on your needs. A clue that it is an electric one is that it has an electric presser. It is composed of two electrically heated hot plates which press each other to cook your roti. This is the most common type used in Indian kitchens. Some models can be used to cook other flatbread like khakra and paratha. This is the most convenient type and needs the least assistance from you. Just add all the ingredients inside it and you can already walk away. When you come back, you can enjoy the finished product. This is the fully automatic type. 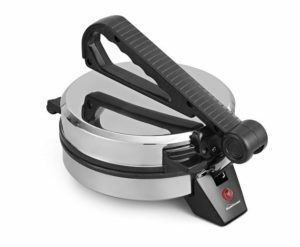 Another advantage of this is, it is not just a single roti maker but can do multiple roties and even different kinds of bread as well. Now you know the 2 different types of roti maker, let’s turn the page and discuss on the things you need to keep in mind before buying a roti maker. Make sure to note everything that will be discussed below so you can stir away from any regrets not being able to get that best roti maker for your home. It is important that the price must fit with your budget. But for roti makers, the price equates quality. Don’t settle for less as it may cost you more in the long run. Cheaper models might not give you the roti quality you want or may lead you to shell out more money for repairs. Balance the quality to that of your budget so you can save yourself from frustrations. The price also differs based on the size of roti maker you want. So think of this beforehand before buying one. The griddle also known as tawa, should be made of aluminum as it is a good distributor of heat. Also, it should be made of non-stick material so you don’t need to add much oil on it. To make the best roti, choose 8 to 10 inches tawa sizes. This is chosen also based on the size of your family as some griddle material can cook faster than others and with consistent size and quality. You would not want them to be waiting for their roti right! For best result, the cooking surface of the roti maker should reach 425 degrees Fahrenheit. Roti maker consumes less power so it is one of the most economical appliances in there, especially as it saves you from using gas. But more or less for a maker with a 10-inch tawa, it requires a total of 1000 watts. a. ON/ OFF Indicator Light – to know if the product is working or not. This is also a safety feature for some with auto off when the heat limit is reached. b. Shockproof Body – safety feature of almost all roti makers. Because it works with a lot of electricity to come up with heat. The body material is built to avoid electric hazards. c. Non-Heating handle lift – some lift/handles have an extra coat as added protection against heat and electrical accidents when touched. d. Adjustable Temperature Knob – usually has 3 temperature variation to choose from. So you can adjust just how well you want your roties to be cooked. Take time to take to consider all the things indicated above before you make the decision on buying a roti maker. You would just want to get the perfect partner for your home, the one that will make your family adore you more for you make the best roties they could ever taste. That is if you just get the perfect roti maker to help you with that. Below is the list of the six top roti makers that could help you make that possible. We have summarized information and reviews online to come up with this. Read on below to find out more about each of top models. Made with utmost engineering precision from its sturdy outer body to provide you with rotis that are fluffy, light and the type you see on advertisements. Because it is lightweight, it comes as handy for family gatherings and festivities. This is just the right one if you intend to make wider rotis that are perfectly round and fluffy. With its small and compact design, it occupies lesser storage space in your kitchen. This may be lightweight but this roti maker is very durable and very dependable in making just the right khakra and roti your family will definitely like. 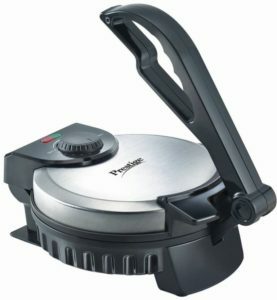 This premium looking roti maker looks tough from its handle down to its body. The hard plastic bottom makes it surely shockproof. This is a very good addition to your modern kitchen. This is perfectly designed for making fluffy and smooth rotis. This is a perfect roti cooking partner for bachelors. You can make delicious rotis in just seconds with this one. 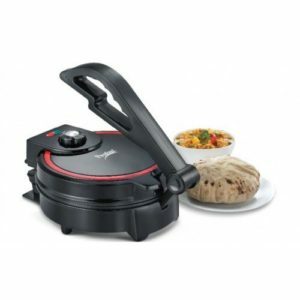 This multi-feature roti maker will help you safely and efficiently prepare round, delicious and fluffy rotis every time. Its concave curved based makes that possible. Also with its intricate design, you’ll want this to be part of your kitchen. Choose any of the above, as it is not just you who will love it but definitely your family and friends as well. No need if the roti maker is a non-stick coated plate. But for some you may still put oil in your liking should you want your roti output to be a bit moist. It usually depends on the roti maker model, but the lower lid always has a higher temperature than that of the bottom. For 900 watts models, the upper usually has 300 watts and the lower, 600 watts. With this being said, the bottom can really get hotter than the upper lid. Yes, and you should. But only wipe clean the non-stick surface with a clean cloth. Or to remove stains, oil marks or residue you can use a bit water damp cloth. Yes if the roti maker is multipurpose. Check the specifications of the model to know exactly which ones can be used to make other things besides roti. These are some of the answers to the most commonly asked questions about roti makers. Following are few tips you need to keep in mind to get that best roti maker for you. Many users are frustrated for not being able to come up with the best quality of roti from their roti makers bought. These are not entirely due to the low quality of the purchased model but rather the users were not able to follow the instructions indicated in the manual or in the demo CD included in the package. The dough consistency to be put in the roti maker has a lot to do on what output quality it will come up. So making sure that user manuals or demo CD’s are included in the package should be prioritized. It is always based on your roti size preference. Some would love the perfect 8 inches size or bigger so always see to it that the tawa or griddle size of what you will be buying can provide you that size. Because roti makers technically work on heat, make sure that the body and handle materials are made of high quality heat resistant and shockproof material. The indicator lights are also a safety feature a roti maker should have. Never look for what is the cheapest, rather look for the product that’s worthy of the price tag it has. A bit high priced ones are the ones which have better quality. But don’t go over budget by getting a roti maker packed with a lot of features you won’t actually need. Keep these tips in mind when buying a roti maker and you won’t regret. To wrap us let us leave you with this quick video you’ll truly enjoy. Roti Maker in Action! 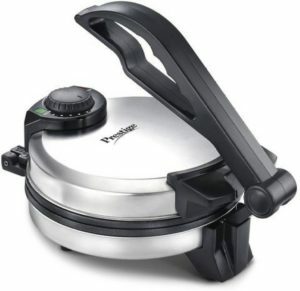 I hope you had fun reading through this review and were able to decide on the model that is best roti maker for you. Buy that before it goes out of stock!